Man builds cathedral. Hardly the most exciting premise for a book huh? So it’s probably just as well that Follett’s 1989 masterpiece is about so much more than just the combining of bricks and mortar. Spanning 29 years in the 12th century, The Pillars of the Earth follows all the major players in the building of the (sadly fictional) Kingsbridge Cathedral – from the righteous Prior Philip and his Master Builder Tom to the despicable William of Shiring who does all he can to disrupt Philip’s plans. That’s the plot really except it’s about much more than just the building of the cathedral. Throughout the 29 years people die, they get tricked into bad marriages, they become business leaders and they lose everything they have. Children are born and raised, pilgrimages are made and behind it all a civil war rages which periodically forces monks and earls alike to choose allegiance to a potential new monarch. So as you can see there’s a lot going on in this 1076 page novel which definitely makes up for the occasional two page description of a new style of wall. I’ll admit that when Follett goes into depth on the actual building work (which doesn’t happen all that often), I did tend to skim read a little apart from one very exciting section where a young builder invents the flying buttress! 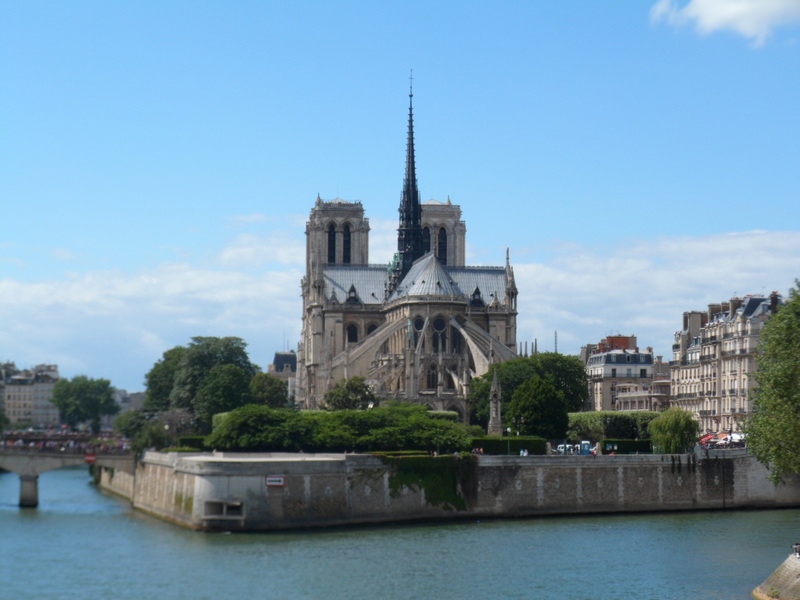 Pictured above you can see an excellent example of the use of the flying buttress on the Cathedral of Notre Dame in Paris. They’re the kind of arches on the outside which are used to support the walls from the outside. I have a friend who, when we went to Brussels, spent a lot of time pointing out this particular architectural feature so to read a story of someone inventing it was very exciting for me! I have to say that I was surprised by how much I enjoyed this book and I would say a major part of this was down to the language used. Although it’s set in the 12th century, the writing and conversation is relatively modern – there are no ‘thee’s and ‘thou’s – which I’ve seen some review complain spoils the realism but for me it’s about making the time period accessible. The prose isn’t entirely modern but it’s up to date enough that the writing isn’t intimidating which I find to be a problem with other books set in the same period. I know language has changed a lot over the last thousand years and that the way this book is written isn’t the way people would actually have talked at the time but if I’m going to commit to reading over a thousand pages, I don’t want to have to read every sentence twice to be sure I know what it says! My main regret with this novel is that Kingsbridge is a fictional town so I’ll never be able to visit the wondrous creation of Tom et al but Pillars of the Earth was certainly a masterclass in the lives of 12th century folk as well as a very entertaining saga telling tales of both everyday people and the upper echelons who ruled life in the 1100s. A few years ago I was offered a free ticket to see the stage show of Birdsong so (because I never turn down a free theatre ticket) I went along with absolutely no idea what I was letting myself in for. What it turned out to be was an utter sob-fest set in World War I. So it was with some trepidation that I approached the book which I expected to be even worse. Birdsong tells the story of Stephen Wraysford who first arrives in France in 1910 as a young man of 20 to learn about the textile industry in the northern city of Amiens. The first section of the book deals with Stephen’s time with the Azaire family and the passionate love affair he embarks on under their roof which will mark him for the rest of his life. We then skip to 1916 and a trench on the Belgian border where we meet Stephen again as a Captain in the British army. The introduction to wartime is as brutal as it can be with three characters dying in the first few pages of the 1916 section and little respite from then on. Every page bristles with the possibility of death or serious injury yet despite this it wasn’t the tear-jerker I was expecting. By this point death has become a fact of life for Stephen and all the other men and it is relayed as such in the text. It was a very grim read, there no doubt about that and there are some very gory descriptions making it definitely not a book for the faint-hearted but it only drew a tear from me on a couple of occasions (and that’s saying a lot, I’m the kind of person who cries at the drop of a hat). I imagine that the war was a very surreal experience for those whose lives were consumed by it and that unreality is conveyed very clearly in the text, they shift dramatically between front-line warfare and rest days in some of the towns further from the line but there is a sense of abstractness that lies over everything. One of the most surreal moments was Weir’s story of his visit home and his parents’ complete disinterest in everything he had seen, experienced and felt which made it one of the parts that really moved me. Then, about halfway through we shift completely to London in 1979 and some seemingly unrelated woman on the tube. It emerges gradually that she is looking into her family’s connection to WWI and I imagine that this part of the story was brought in as a way to tell what happened after the end of the war and to tie up the more romantic elements of the book but I felt it was completely unnecessary. I didn’t care about Elizabeth, about her relationships or any part of her life and I feel that all she did was detract from the central story. I was particularly annoyed that after the dramatic and moving conclusion to the book’s front-line events we were returned to Elizabeth which really spoilt the ending for me. But that remains my only complaint, all in all Birdsong has left me with an urge to find out more about the terrible events of WWI. I feel like I know a reasonable amount about WWII but I only have a very vague grasp on the facts of The Great War which is awful given how many men and women gave their lives during the conflict. Today we are 100 years on from the horror of the trenches but we must never forget. The end of another year is upon us and I welcome you to this, my end of 2014 post in which I endeavour to remember what it is I ‘ve done this year and make some bold claims about how I’m going to make the most of the coming 12 months. 2014 was an incredibly exciting year for all sorts of reasons (although the measly 22 posts on this blog probably don’t reflect it very well). Firstly I finally completed my PhD passing my viva in October and meaning that I can now call myself Dr Kathy. Secondly I got myself a job with the stem cell donor register Anthony Nolan which I absolutely love. It meets my remit of being very sciencey without needing me to actually DO any science. I’m directly involved in giving patients a second shot at life and it feels great. Add to that the fact that I work with a group of really lovely people and I couldn’t really ask for much more! But it wasn’t just career-wise that I had a great year I also saw a lot of great theatre productions, went to some incredible gigs, finally finished knitting that jumper I started two years ago and all sorts of other stuff. In amongst all of that lot I also found time to meet my reading target of 52 books finishing number 52 on the 30th December. In fact I actually read Mockingjay twice in quick succession because I was so surprised by how much I enjoyed it this time round making for a total of 53 but I’m only counting it once. I read 52 books with a total of 17,904 pages which is an average of 48.8 pages/day. 59% of the books I read were written by male authors and 80% were written by authors I hadn’t read before (and the 20 books I read by authors I knew were written by only 8 authors including: 5 by Stephen King, The Hunger Games, and the Silo trilogies). I read 4 non-fiction books (7%) which as usual is pretty poor so I might have to see what I can do to up that figure in 2015. The average age of the books I read was 23 years with the youngest being published in 2014 (Willow Trees Don’t Weep and Daughter) and the oldest, A Christmas Carol, in 1843 making it 171 years old. I gave an average of 4 stars with a massive 17 achieving 5 out of 5 and only one volume receiving a lowly 1 out of 5 (I won’t name and shame but I did write a scathing review if you care to hunt for it). But getting on to the really important stuff, I only read five books from The List which absolutely shocking and brings me up to a rather pathetic 57 out of 100. This is definitely something I’m going to work on this year. I got a couple of List books for Christmas but my problem is that I’ve read all the exciting books and I’m down to the stuff I’ve been putting off. However this is no good so I’m going to make a promise to you, my dear reader that this year I will read AT LEAST ten books from The List. Hold me to that, I need the encouragement. 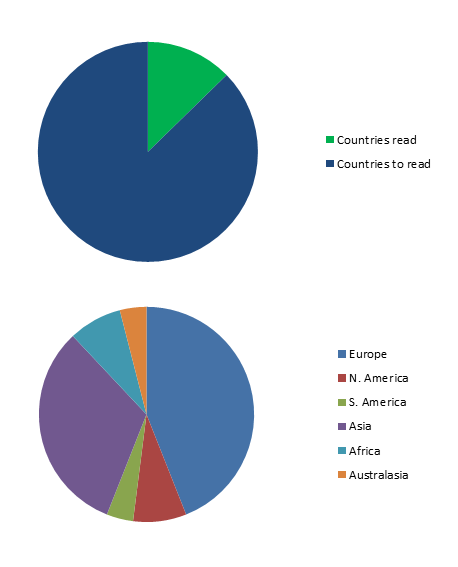 12% of the world read and I’m very much looking forward to continuing this project this year! There you go, my opinion of The Great Gatsby summed up in a single word. Or to expand: Did not like. I wanted to like it, I’ve heard great things about it and I have one friend in particular who is so keen on the 1920’s that she’s theming her wedding after that time period so for her sake I moved Gatsby up the pecking order and tried to like it. But I didn’t. I found the writing style very hard to get to grips with, I don’t know what was wrong with it exactly but I found that I could read for pages with no idea what was going on and then I’d go back and reread them only to have the same thing happen again. I think it didn’t help that the prose tended to jump about a bit characters would get the briefest of introductions but then fifty pages later you’d be expected to remember who they were and why they had featured (and the book is only 110 pages long). Or time would slip so that you’d be at once in the past and the present without any real clarity on why. The characters themselves also really infuriated me. I suppose they were the Made in Chelsea of their time, lots of money with no clear indication of how they came by it and no responsibilities that can’t be shirked for a day or three of drinking and driving about the country on a whim. That entire lifestyle is alien territory to me and I find it utterly mystifying as to how anyone can live that way. So I probably never stood much of a chance at bonding with these characters but still. Having said that our narrator Nick Carraway was also a bit of an outsider. Caught up by mere proximity to Gatsby and a connection with the Buchanans he is pulled along in their whirlwind of champagne and excess to the bitter end. I quite enjoy the outsider narrator theme as it gives the common yokel a point of reference within the book and someone to hide behind when it all gets a bit much so I did like Nick. Right up to the point where he suddenly realised that he’d forgotten all about his birthday on account of being taken to New York and forced to participate in wanton renting of hotel parlours and drinking of mint juleps. I mean really, who lives this way and why?! There’s a jumpyness to the whole novel which reminded me a lot of On the Road another book I hated (rant here) and to a lesser extent The Secret History which I enjoyed but felt a similar disconnect to (more balanced review here). I think it was this nervous energy which meant that despite it being very short I found Gatsby quite exhausting to read and at entirely the other end of the spectrum from the previously reviewed Midnight’s Children. Here’s hoping my next review will be more positive! I was meaning to make this a brief post and suggest that for more expansive reviewing you read a review by my fellow Gatsby-hater Becky but I seem to have gone on a while. However I thoroughly recommend her review as it is better thought out and much more entertaining than this driveling stream of consciousness. Read it here. These two sentences tell you all you need to know about this book really but I’ll expand slightly in the interest of creating a more lengthy post. 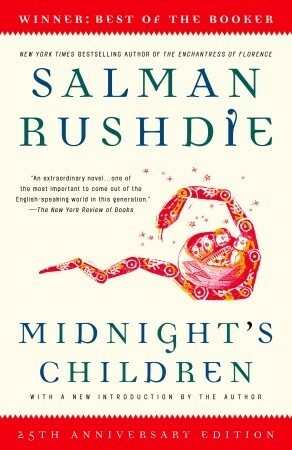 The narrator of Midnight’s Children is Saleem Sinai who was born at midnight on the day that India became an independent country. It takes quite some time (about a quarter of the book) for us to get round to this momentous birth as Saleem starts by going into great detail about his ancestors (which bored Padma to whom he is telling the story as well as me). What follows is an in-depth analysis of Saleem’s life and times including his overblown interpretation of the most insignificant of events. Because of the historic moment of his birth Saleem feels responsible for the fate and life of India and added to that rather pompous view he also develops supernatural powers which link him to all the other children born between midnight and 1am that morning. There’s also a lot of metaphorical and philosophical type chat which is largely responsible for Padma’s (and my) frustration with the long-winded story-teller. As she says, it’s hardly surprising if a baby isn’t particularly conversant but to Saleem, the (newborn) baby’s silence was a product of the time of it’s birth and indicative of the significant role it would play in the future of India. I found a lot of this book hard to swallow as it made very little sense and was frankly ridiculous a lot of the time and I found Saleem’s views of his life to be arrogant and laughable although there was no real humour to be had. Having said that the story was not unenjoyable and it did make for an…interesting read. I also enjoyed relating the latest crazy developments to my work colleagues. So I remain confused about why Midnight’s Children is so highly lauded and I’m not sorry it’s over. Having said that I don’t want to put anyone off reading it, I gave it 3 stars on GoodReads because I didn’t dislike it as thoroughly as this review makes out but if you are going to read it then I want you to know what you’re letting yourself in for! It’s been a good while since I last read a book on The List but I’ve put that right by going for a high one – number 11, Catch-22. To be honest I knew very little about this book going into it. I knew it was about the war and I knew that my dad loved it, neither of which suggested that it was something I would enjoy. Happily I was wrong. The story, in a nutshell, is of Captain Yossarian and his crew as they try to survive the last few months of World War II, preferably in one piece. Yossarian gives us a very personal outlook on war. He can’t understand why everyone around him is trying to kill him – there may be a war on but why does that mean that HE has to die? It’s a view that the other characters find hard to relate to but I think that’s exactly how I’d feel if I ever found myself in his position. Since this is a book about war and dying, I was expecting it to be a bit of a slog and somewhat depressing. The absolute last thing that I was expecting was to find it so funny that I actually laughed out loud but I did, on many occasions. The subject matter may not be particularly funny but the way it’s told is. Yossarian as out main character has a very dry outlook on life which is something I enjoy but aside from that, all the characters are constantly tripping each other up and turning things round on each other in order to get what they want. It’s very cleverly written and very funny. But of course it IS a book about war and there is a political point being made here. There is a turning point towards the end of the book where things get a lot darker pretty fast and it can be hard to keep on reading but it’s definitely worth it. I have to admit to struggling with the end of the book, it all got a bit weird and dream-like for a while but right at the last minute Heller pulled it back and wrote an ending which had me practically singing it was so good. “Every one of them,” Yossarian told him. “Because…” Clevinger sputtered, and turned speechless with frustration. At 83 on The List Holes is one of the few children’s/YA books I haven’t read. It was published in 1998 when I was 10 and I spent much of the next year looking at a poster of the cover that was on the wall in my school library both intrigued and slightly terrified by the giant lizard on the front. In 1999 I went to high school so didn’t see that particular poster again but I can’t tell you how pleased I was that when I finally got a copy of the book it had that cover, reading a different version just wouldn’t have felt right. I knew I wanted to read Holes, I didn’t really know what it was about but that poster had stuck in my mind so vividly that I knew I had to read it. I’ve passed up countless opportunities to read it in the past, I feel a bit like the book is Ross and I’m Rachel from Friends, we know we’re going to end up together but it’s a long time coming. Alright, weird analogy but you get the picture. Anyway, last Sunday I was lying in bed, not quite ready to get up yet so I thought I’d read a few lines and see how it went. Two and a half hours later I turned the last page and thought to myself, ‘Why on earth did I wait SIXTEEN years to read this book? !’ Safe to say I enjoyed it. To give you a brief summary, Holes tells the story of Stanley Yelnats, sentenced to 18 months digging holes at Green Lake juvenile correction facility for a crime he didn’t commit. Green Lake is a harsh place, in the middle of the desert where water is tightly rationed and there are any number of things hiding in those holes waiting for their next meal to come along. Not only that but being overweight and cursed with the bad luck of his ‘no-good-dirty-rotten-pig-stealing-great-great-great-grandfather’, Stanley is used to being at the bottom of the pecking order and now has to find a way to live with a group of hardened teenage criminals. Can Stanley find a way to survive his sentence? Why exactly are they digging holes in the middle of the desert? And will anyone ever believe in Stanley’s innocence? It seems like a pretty grim situation but Holes is a story of friendship, loyalty and repairing past mistakes told with an innocence and a dark humour which makes it impossible to put down. Interwoven with the main story are subplots which tell the story of how Stanley’s great-great-great-grandfather managed to get his whole family cursed and the tale of how Green Lake lost its lake both of which add depth to and support the book’s overall theme of destiny. There’s no doubt about it, Holes was definitely worth the wait! And if you can read the final showdown without squirming, you’re a braver soul than I am.